Program yourself to have whatever you desire - play this meditation before you sleep at night and as you awaken. “This workshop surprised me with just how good it is. Mary King has distilled mountains of brilliant information and presents it in a crystal clear and fun manner... Every woman needs to do this course, the earlier the better!" "Mary, You have a perfect grounding to really empower women all over this country. Thank you for having the courage to share and the ‘Lioness’ to empower." "Very thorough and comprehensive, thought-provoking and delivered with heart. Just the shot in the arm I needed to get back on track, motivated and committed to generating wealth for me." In the old days a man was said to be ‘down at heel’ when his financial situation meant he didn’t have enough money to repair his shoes that had worn down at the heel. As I think about it now, I cannot recall that description ever being applied to a woman. I would like to see that situation changed. 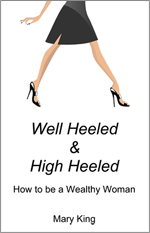 How lovely to be a woman who is well heeled and high heeled and know that term describes a woman who has achieved financial freedom and celebrates life. This book is a mixture of inner and outer wisdom. The outer guidelines are the obvious practical steps you need to take to ensure you get control of your physical wealth as it manifests in the earth plane. The inner path ensures you align yourself with universal energy to create the outcomes you desire. wealthy. Having money sets you free. Imagine your life with plenty of money. Do you think it could be fun to be a wealthy woman? When you are financially independent you don’t have to rely on a partner, employer, family or government to look after you. You can be your own woman with a greater sense of personal freedom. - how to turbo-boost your mental money blueprint. teach you some of these strategies. Mary King is currently not presenting workshops. Read the blog to see latest developments. Mary King worked as a Pharmacist, but sold her pharmacy in 1992 because she learned that discovering your inner power was a much more powerful healer than any medication. She formed the company The Power to Choose, and began using the Voice Dialogue method to lead counseling sessions. 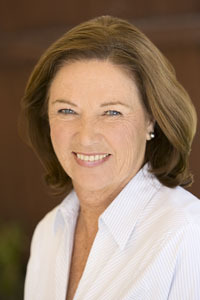 Mary King has been a consultant to many leading professional and business people. She combines her knowledge of inner voices, health and universal generalised principles to promote successful living. Find out more about Voice Dialogue.